Since the first time [Matt] saw an e-paper display, the idea of using it as a regularly updated, non real-time display consumed him. It really is the perfect platform for very readable calendars, agendas or, as [Matt] found out, a weather display. [Matt]’s build uses a server to fetch and parse weather data and forecasts from NOAA. This data is then inserted into an SVG file, rendered, converted into a PNG, and finally converted into a grayscale, no transparency image required by the Kindle. After the image is crafted by [Matt]’s server, a small script running on the Kindle fetches the image, clears the screen, and displays the image. This entire process happens twice a day, often enough for [Matt] to get a good idea of the weather outside without having to look out a window. The really striking feature of [Matt]’s build is how good his weather display looks. The wonderful iconography of this weather display comes partly from graphics found on The Noun Project, with a few weather conditions drawn by [Matt] himself. It looks great, and is an awesome example of an excellent use of e-paper. It looks awesome :) Wish you could buy e paper screens at lower prices then a full e reader. I agree. Seems like there is a real market opportunity for one of the maker supporting companies (probably chinese) to sell an e-ink display with controller. I think it would be a very popular product. At least there’s just so much of this stuff out there now that you can pick up used ones for a good price. Maybe not as cheap as the E-Ink display by itself, but if you get the whole package you have the option of using the wireless radios and system-on-a-chip to make your project more self-contained or portable. Exactly what I was coming to ask. Using an epaper-friendly webpage would prevent the need to jailbreak a Kindle. Though, the issue with using a webpage is that the Kindle may go to sleep. I’m so going to do this with my Raspberry Pi. Good thing the Farnell lead time is down to 2-3 weeks, eh? And how exactly are you going to control an e-ink panel from a Pi? He is going to mod the ereader to be controlled by a pi and then post a article on HaD about it. Looks pretty clean. I wonder how much work it’d take to make a simple e-paper display for this instead of using a Kindle? Would also be nice for watching system stats, similar to conky. [Matt]‘s build uses a server to fetch and parse weather data and forecasts from NOAA. This data is then inserted into an SGV file, rendered, converted into a PNG, and finally converted into a grayscale, no transparency image required by the Kindle. You mean svg (Scalable Vector Graphic)? I have a half working PRS505 here which as a broken lower half of the screen. Its a controller chip fault however the upper half still works. Wonder if this is feasible to turn into a ghetto fridge magnet weather / shopping display? I’ve re-waterproofed the display with Superglue and it seems stable, a couple of minor fine lines but not too bad. I would love something like this for persistant Google Calendar display..
That’d be really nifty with a kindle touch. This is beautiful! I really wish there were e ink screens for sale that we could mess around with instead of having to use e-readers. depending on your definition, i think this is real-time..
for instance, in computing the definition is of real-time is: the update interval is fixed, and the computing must be finished before the next update. so this qualifies, because his display cycle is started 5 minutes after his retrieve/compute cycle. there is no check if the computation has finished, it is expected to finish in real-time. which is about £39 over here. wireless, and no way to add it. 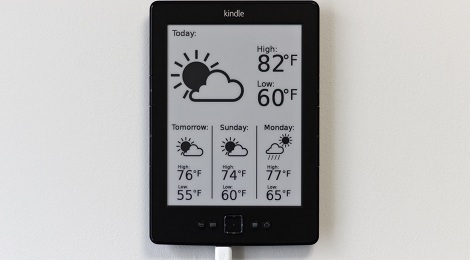 there is a kindle weather app, but I don’t know if it has the across-the-room readability of this setup. and it probably can’t prevent the screensaver from activating. This as a screensaver would be nice, though. How can i jailbreak the kindle 5th generation non touch? (the same of the picture)? Does anyone know a hack that can turn a kindle on and off at a set interval? I need this for something and know nothing about programming. Regards the comments on standalone e-ink displays and e-reader prices: I think a device with e-ink display, touch screen, wireless, USB, 1G RAM, and case is damn cheap at $100. Buy a used one and the price is half the cost.